In late 2012 I met with Tim McMurray and we recorded a series of videos on Mac 1’s involvement with Paintball in the mid to late 1980s. Tim mentioned a few products I hadn’t heard of before, including his semi automatic design which he prototyped but then destroyed to let off some steam after being screwed over one too many times. In the following video (from late 2012) Tim McMurray takes a look at the G&H Customs Lever Action and is reminded of the short lived Pump Twist Dual. “We used to do a very similar thing were we would try and make [the stock K1/K2 rifle] as good as it could be. We twisted the action in the stock 120 degrees, putting the feed tube on top, barrel on the right. 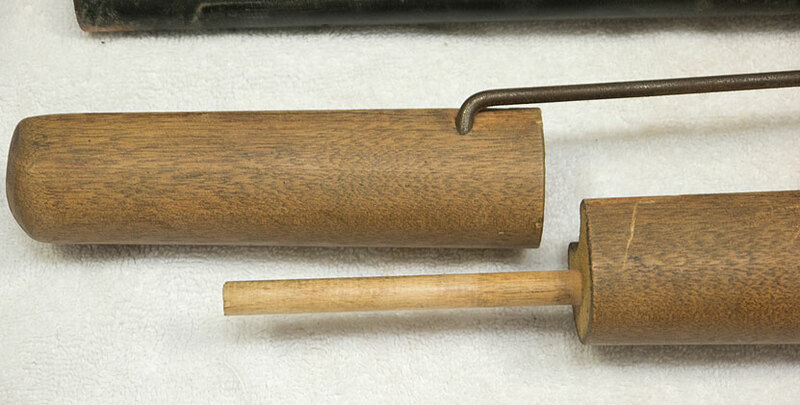 We called it a Pump-Twist-Dual, it had a dual co2, it had a pump action where we took the front part of the wood stock and split it from the back, put a dowel it could ride on and the front of the stock was actually your pump [handle]. This cropped photo, from the May 1988 issue of Frontline Magazine, shows the only printed example I’ve come across of The Pump Twist Dual. See the full size page scan from May 1988 Frontline Magazine here. A cropped close up of the May 1988 Frontline Magazine scan of the Pump Twist Dual. At first I couldn’t tell from the photo if the rifle’s tubes have been rotated, but the gun definitely has a pump handle made from the long stock. 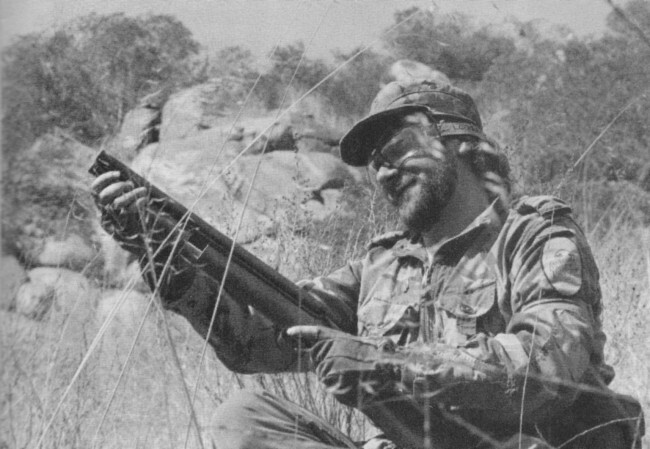 I thought, maybe Tim imagined rotating the brass tubes of the gun, but after looking a little closer at the angle the paintgun is held in the stock in the above May 1988 Frontline photo, the amount of the barrel tube that is visible at that angle means the tubes had in fact been rotated. 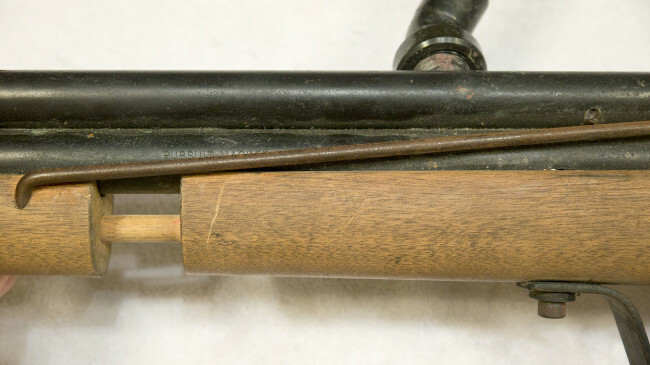 The largest clue is the fact that none of the lower tube is showing and the pump rod is directly against the upper tube and the upper tube is directly against the stock (I hope that makes sense). Unfortunately this rifle was converted to direct feed. Tim told me he thought they made around 25 Pump Twist Duals and his guess of 1986 in the video would be closer to the accurate time frame they were built. Since this rifles would have likely been built off a K2 and K2s probably were arriving (stamped for PMI) to southern California in mid 86. 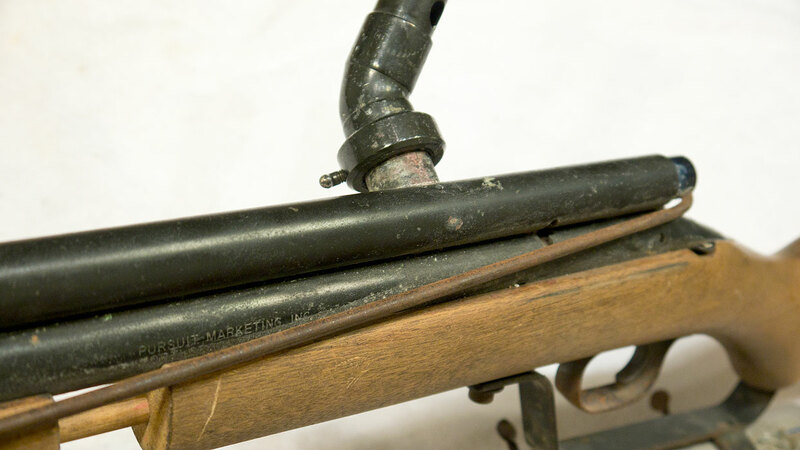 Rifle’s long stock was originally cut down to make the pump handle. 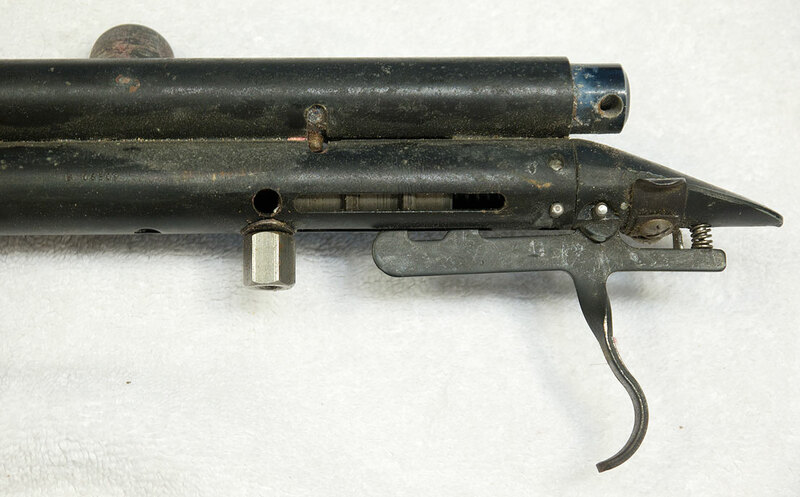 Based on the number of only 25 and the early date Mac 1 modified the rifles for the Pump Twist Dual modification, I didn’t think I would come across this pump rifle. But last week, a Pump Twist Dual popped up on ebay out of La Habra, California. At first I discounted it as just another hacked up KP that a high school kid had modified in shop class but after a couple seconds of looking at it I had to check the old Frontline Magazines for the only photos I had seen. I wasn’t sure if it would be better trying to get the seller to end the auction and sell the rifle off ebay or take my chances with the auction. 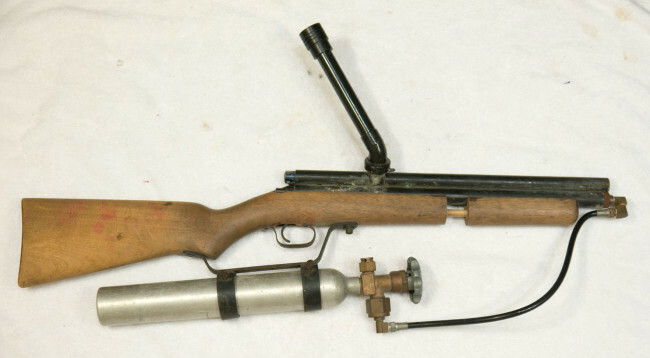 I decided that I couldn’t risk it, if someone other than myself picked this up, they could end up trashing the stock’s pump, rod and bolt assembly and then the Frontline photo might be the closest we ever get to finding one. And if I won the auction I would likely still have to drive to pick up the rifle since I wouldn’t want to risk the stock breaking in the mail (yes this happens too often). 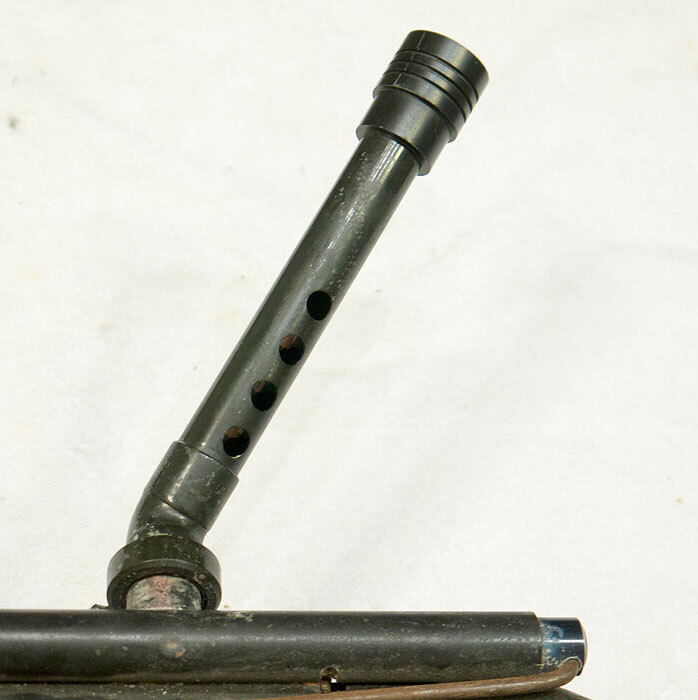 The Constant Air Adapter is an assault line model with the oring slot (and even had an oring until I ripped it off 5 mins before taking this photo) that was used to seal on rifles which used the live chamber lower tube (for dual co2s). So I drove to La Habra and figured I would buy it and eventually drop a stock feed kp body of some type into it. The paintgun was complete seized up and will definitely require some work before it’s firing again. The 10oz Thermo tank with the old style Thermo valve is dated 9, 1986. La Habra was only about 40 miles from Los Angeles, so I drove over and picked it up from the seller, Junior. Looking at the rifle I didn’t think this rifle had the full Pump Twist Dual modification, only the stock modification. But once I picked the rifle up I didn’t think the pump handle looked right? The pump handle almost looked tweaked? Sort of like if it had been bent for a bolt that sat closer to the stock and then bent up when the stock feed tube was removed and converted to direct feed. Well sure enough, after removing the stock I saw the extra trigger slot and mounting hole so the body was a genuine Pump Twist Dual model that’s unfortunately been converted to direct feed. I guess I’ll have to convert it back to stock class feed. Extra Trigger Group and Stock retaining Cut cut outs to off set the rifle. From my research on the Elevator Gun I constructed a timeline for when Tim worked with Stan Russell and Earon Carter and they produced various products. 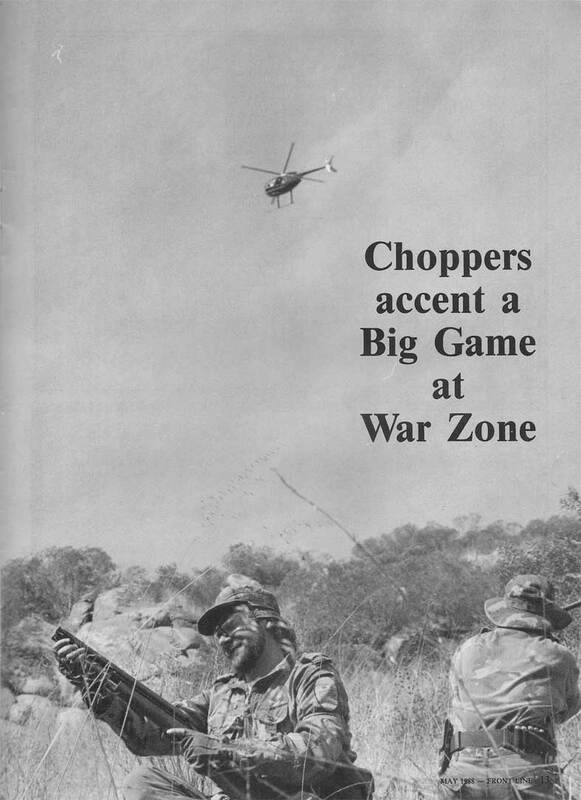 I had estimated the cut down rifles (long K1s) were built in mid 85 (manual was dated September 85) and then Sheridan released the K1 rifles in early 86 (manual dated 3/86). And the first K2s around mid 86. This rifle was likely built from a K2, which was stamped for Pursuit Marketing Inc (PMI) and has the serial of B08509. 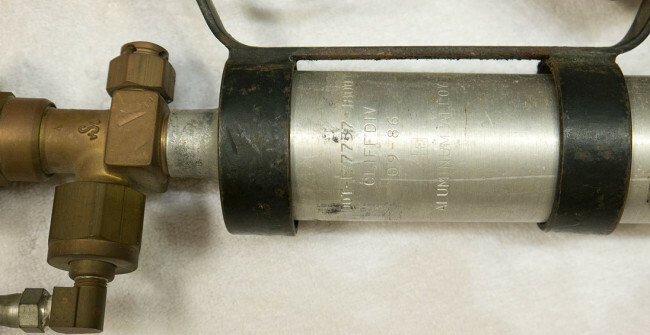 This paintgun was likely originally built in mid 86 and then, from the date on the tank, September 1986, was converted to direct feed a few months later. Here are the vent holes drilled towards the end of the lower tube. I’m not sure if one of these holes was drilled in order to use the dual 12 grams and then an additional hole was drilled later for the constant air adapter. Another shot of the stock broken down off the rifle. So another really luckly find and neat project. Eventually it will be converted back to stock class and I’ll rotate the barrels tube. Anyone else remember the Pump Twist Dual? A dual 12 gram piercing assembly that came from Tim at Mac 1 Airguns. This piece screws into the lower tube and allows two 12 grams to be used.